When you list your home for sale, the objective is to get buyers in the door, make them fall in love with the home and make a great offer for a smooth, hassle-free closing. Obviously, part of the aforementioned formula, is, well, letting people into your beloved home. People who you have never met before and probably never will, will be parading through your home and kicking tires. And yes, some of them will even pee in your pristine, spotless toilet! This can be a stressful scenario for some home sellers, especially those who appreciate their privacy and those who keep their homes neater than a pin. Very few people are willing to buy a home sight. Buyers will want to see your home in person before committing to making an offer and you need to make your home available to them. Yes, it's your home and you are completely free to control buyer access to it. However, it is important, if at all possible, to make your home as accessible as possible for that first week after you hit the market to maximize your chances of a quick and successful sale. If you overly restrict access to you home, you are reducing your chances of getting the best possible price for it. Will every buyer respect your home with the same level of respect you show it? To be brutally honest, probably not. It's best to be ready yourself for some minor, short-lived nuisances, but when you close it will be worth it all. First of all, how do buyers get access to see your home? The first way buyers come to see your home is by viewing the home with their agent. The Buyer will contact their Realtor and schedule a viewing appointment. If you are living in the home, the agent will contact you to schedule a time that works for you to be out of the home. The buyers have to be with their agent to get access. Buyers cannot just walk up, knock on the front door and demand to see your home. Here the buyers are "supervised" and guided by their agent. There will be a lockbox with a key to your home located on or near your front door. The lockbox can only be opened by a real estate agent plus the lockbox will record which agent showed your home. Buyers who view the home with their Realtor tend to be the most serious buyers. They are not going to wait for the open houses at the weekend. The other main way buyers get to see your home is through open houses, which are usually held on Saturdays and/or Sundays. This is when your home can become overrun with buyers (some genuine and some tire kickers), nosey neighbors and people who have no interest in buying your home and are just looking for something to do. Open houses can be a case of controlled chaos, particularly for the most popular of homes. This is when you home will be getting poked from all angles. 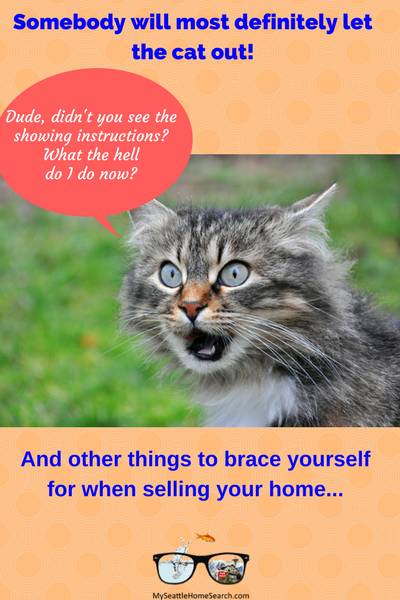 So what are some of the things that might get Home sellers you riled up? "Viewings between 9am and 7pm ONLY. No exceptions. Must text owner with a minimum of one hour notice (small baby in the home). Please DO NOT call the sellers. Leave all the lights on. Do not let the cat out. Thank you”. Despite these viewing instructions/restrictions being spelled out in plain English, (1) the sellers will still get lots of phone calls instead of texts, (2) requests for 8.30pm viewings or (3) agents will pull up outside the home and ask to see the home straight away. Just say “NO!” If they can’t read, then they shouldn’t be writing real estate offers either. 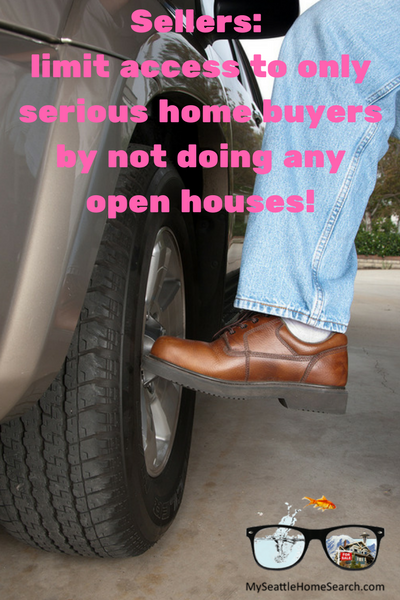 Tell them to read the online viewing instructions or call your Realtor. Agents who fail to honor showing instructions or fail to leave a business card when they show your home can be fined thousands of dollars. Shoe violators: Despite providing shoe covers and the prominent placement of a large sign at the front door that says in red letters, Please Remove Your Shoes Or Use The Shoe Covers Provided, some buyers and agents will still stomp through your home in their uncovered shoes bringing a little bit of outside nature inside with them onto your professionally cleaned carpets. Lock-challenged agents: Despite the sign on the inside of the front door that states Please Make Sure All Doors Are Locked Before You Leave, there's a good chance someone will leave a door unlocked. THAT neighbor! Your neighbor who you’ve never liked and who hasn't been invited inside your home before will be itching to snoop around during the open house and see what you have done with the place while muttering under the breath how much better their own home is. On the upside, they probably won't need to use your toilet. Cat loyalty myth exposed: someone will most definitely let the cat escape. "Free at last, I'm outta here!" Fishbowl: You'll be enjoying your dinner and notice out of the corner of your eye strangers walking around your backyard. Yup, it's those buyers who think all listings are vacant and they are free to stroll around the outside of any home they come across with a for-sale sign out front. The Yo-Yo/weight gain syndrome: If your home proves to be a popular one, prepare to be in and out of your home like a yo-yo, prepare to dine out a lot out and possibly add a few pounds in the process. Cheesecake Factory anyone? Overly energy-conscious buyers, please stop turning off all the lights! A home listed for sale needs to be warm and welcoming. You want buyers to see the home immediately they upon opening the front door, not fumble for light switches or fall down the basement stairs. The bed testers: They will sit on your bed and crumple your blankets and sheets. They especially like to sit on beds that have a sign that reads Please Do Not Sit On The Bed, For Staging Purposes Only! If only I had a hidden camera set up to capture the expression on their faces as the bed collapses below them. If the sign said Please Sit On This Bed, they would have zero interest in doing so. The no-turner-uppers: You scramble to get the 2 kids and Rex into the car, do a hyper-quick check of the home to make sure all looks good and then head to the local park to wait while the buyers and their agent go view the home. Thirty minutes later you get a call. "Sorry, we're not coming to see your home after all". Serenity now! 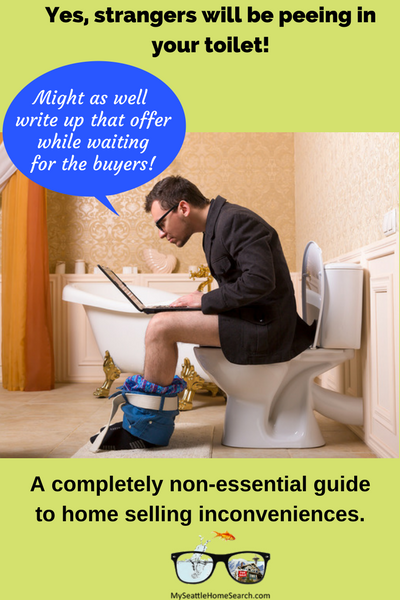 Restrict access to only serious buyers! How do I do that you ask? Buyers who are serious about buying a home will go see homes with their agent and will not wait until the open houses at the weekend. These buyers know what they want, are focused and jump on homes as soon as they hit the market. Open houses, on the other hand, are like Harrods of London....80% of the people there have no intention of buying anything, they're just curious and just like looking at shiny objects. You don't need open houses to sell your home. Just say NO! As I mentioned previously, while some degree of flexibility is good, for those agents who flaunt the showing instructions, stand your ground. If their buyer really likes your home, they can come back tomorrow. As they say, "your lack of planning is not my emergency". Prepare you home properly for the market: if you and your Realtor put the time in upfront in getting your home ready for market including pricing it properly, staging and using great photography, then your home will sell quickly and you will be able to get back to your normal life and move on. If you list at too high a price or don't put the effort into making your home look its best, then prepare to endure those inconveniences for a lot longer. Resist the temptation of having your agent attend all buyer viewings. Some sellers want their agent to be present for all showings to make sure their home is fully protected. Unless you have a Van Gogh and an Andy Warhol hanging on the wall, this is not a good idea. Buyers will feel uncomfortable viewing your home while under the watchful eye of the listing agent. Give serious buyers some breathing space so they can fully view and appreciate your masterpiece of a home. Keep your pets elsewhere: herding cats, dogs, and kids while scrambling to get out of your home for showings is not fun. Reduce the herd by boarding your pets for the first week or have them stay at a friend's home. Now if only you could do the same with your kids. So do I personally ever take a pee at a listing? You don't expect me to answer that one, do you? Conor great post! Thank you for the laughs, insights and Truths. Happy Selling! Thanks for the thumbs up Jonathan! Yup, need a sense of humor in this crazy market. Not only did the agent pee, he left the seat up, and didn't FLUSH! Thanks for the comment Jane. I had a visitor to an open house once who let's say 'blocked the toilet' and quietly left without saying anything. Good times!